In the heart of ancient Verona, between the Duomo and Piazza delle Erbe, enclosed by the meandering bend of the Adige river, the essential elegance of the "Cadreghe" apartments will make your stay in the city of lovers, unique and unforgettable. The apartments have been restored in 2011 and are located in a wonderful historical building. The modern amenities are well integrated with the architectural elements of the past. Every apartment has a comfortable living room with an open concept kitchen and an eating area. The bathrooms are clean, elegant and fully equipped. The beds are queen-sized and can be split into 2 single beds upon request. The bigger apartments have a pull-out couch and the smallest has a baby cot on request. You will find everything you need: heating, air conditioning, coffee maker, microwave, 32 LCD-TV, hair dryer, iron, full kitchen equipment, safe, towels and linens. Change of towels and bed linens once a week. Free of charges for children up to the age of 5. Check-in after 14.00 PM - check-out before 11.00 AM. Hi! My name is Maria Teresa, I live in Verona with my husband and my beautiful three children. I am a textile artist and I really love traveling and discovering the world. 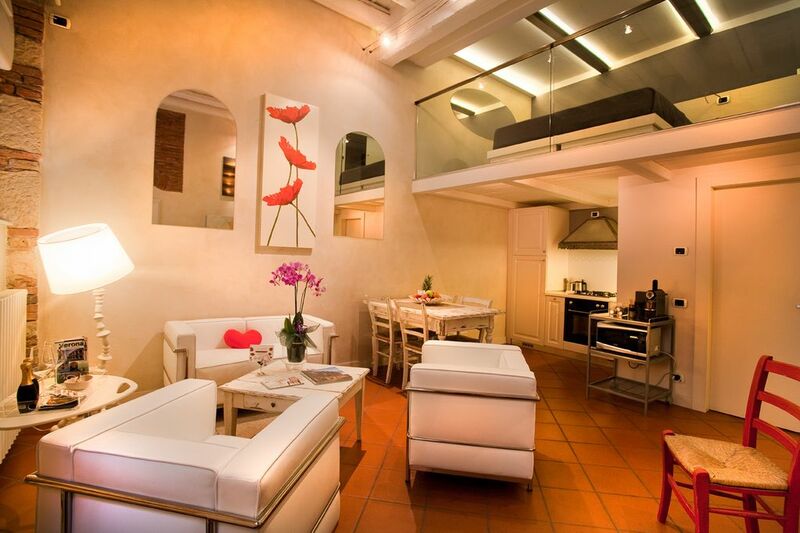 My apartments are in the city center of Verona, in a very typical area called "Le Cadreghe". I have decorated them with care and passion, choosing modern and stylish furnitures that I hope you'll enjoy! In the heart of ancient Verona, between the Duomo and Piazza delle Erbe, enclosed by the meandering bend of the Adige river, the essential elegance of the 'Cadreghe' will make your stay in the city of lovers, unique and unforgettable. The history of Verona is rich. Here lies the foundation of the first settlement on the hill of San Pietro, probably dating from the Neolithic to the present day. The evidence of a history so ancient and rich are visible in many areas but especially in the centre of Verona; historic monuments, the streets and squares and even underground where one can see mainly Roman ruins, but also ruins of ancient civilizations and prehistoric artifacts.